See scan - perfect condition and comes with original ribbon. This is another one of the rarest Bulgarian Communist era medals. 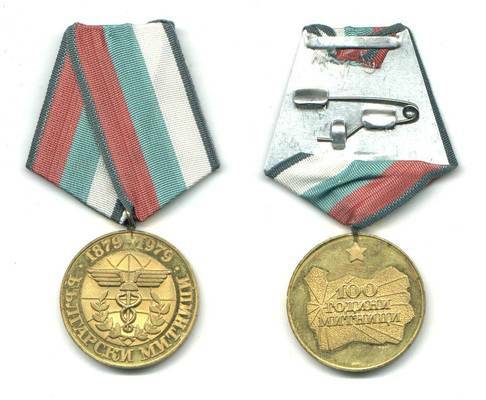 This medal was issued by the Bulgarian Ministry of Interior, Ministry of Finance and the Bulgarian Government / National Assembly in order to award a limited number of highest officials as well as custom officers for their extreme merit to the Bulgarian Customs duty. However, this medal was struck / minted by the State in the State Minting Company, but never got to be awarded. The problem was a big scandal that caused the reverse of the medal. It showed a stylized map of Bulgaria, but unfortunately its borders look bigger than they really are, so this was noticed by foreign officials from neighbouring countries like Romania and Greece, which caused the scandal about the medal and the actual borders... Thus the medal never got to be awarded and only a few pieces were sneaked out among collectors. Scarce and very rare piece.